During the last decade, nearly 330,000 people have left Albania, according to INSTAT. In January 2018, the population has decreased by 0.2% compared to that of the previous year, not only from emigration, but also due to the decrease of birth rates in the country. INSTAT notes the number of people who leave the country is greater than the number of those who return, whom are mostly illegal emigrants. For these people, it is impossible to keep a job elsewhere, or have returned due to the recent Greek crisis that influenced mainly Albanian emigrants losing jobs, or they are earlier emigrants of a certain age, who have made some money abroad and want to invest in the country. Monitor, a well-known economic magazine in Albania, time and again addresses the emigration and immigration issues, pointing out the main trends reflected in Albania. Comparing today’s emigration with that of the ’90s, it is noticed that most people leaving the country are a qualified group. Brain emigration is the buzzword, directed mainly to developed countries like Germany and Canada. Such a thing is creating labour shortage in professions, such as medical, economic/managerial or IT jobs. In the last three years, more than 600 physicians have settled in the wealthy west; in the meantime, many regional hospitals in Albania have insufficient medical staff. The trend includes not only those professionals that find a labour contract, go for Bachelor or MA studies, win US or Canadian lotteries or just want to join their families, who have emigrated earlier. A lot these days have required economic asylum in EU countries or have tried illegal emigration in faraway countries, like Australia. The majority of Albanians leaving the country or just contemplating going abroad are young people. Such a thing is creating a problematic situation in the labour force, decreasing the future productivity. On the other hand, the elderly West is profiting from the Albanian exodus, filling their countries with white, young and hardworking professionals, spending less than they would for their natives. Experts explain that the main reason for the emigration increase is the unemployment prevailing in the country and low salaries, as well. During the last two decades, the country’s GDP has increased by only 18%, mainly due to massive brain emigration, according to Monitor. There was a story of two Albanian youngsters reported in “Dita” newspaper a couple of days ago, which truly illustrates the people’s frustration and pessimism that prevails in the country. A 25-year unemployed Math teacher, after working for a couple of months in a call centre in Tirana, together with her boyfriend, decided to emigrate to Britain, where a relative had promised to take care of them upon arriving. The main problem was the documents, as Albanians need visas to travel to Britain. After some enquires, they were told they could pay 500 euros for a false Italian passport and then travel to a transit EU country first just to be more sure, before landing in England. After acquiring the Italian passports, the young couple travelled to Sweden, where they purchased two tickets for England. Their plan failed before setting foot in England. At the airport, the Swedish authorities discovered their passports were false and arrested them for fraud. It was a terrible experience. They were put in separate cells with absolute security, thick doors that opened only through codes, armoured windows, soft-material furniture, but warm and the food was not bad. However the 25-year-old girl could not eat. She only cried. It seemed the end for her, just like death. She did not know where her boyfriend was, she had no time concept and no one to respond to her questions. She only thought about her family in Albania and how ashamed she felt to be in jail. After a couple of days, an attorney dealt with both of them, demanding them why there are a lot of Albanians leaving their country. From his information, Albania was a beautiful country with good people, but….with corrupted governments. After that, they were taken to the immigration office, together with many other emigrants from other countries, where they stayed for days, until their turn came – they paid a fee of 200 euros for the offence and were banned two years from travelling to the EU. When the couple asked if it was possible to apply for economic asylum, the answer was no; Albania is considered a free and safe place, recently having economic growth and making efforts to join the EU. So, the Swedish authorities made them return to Albania. Do they think of leaving again, maybe after two years? Sure, but this time they will have to find a legal way to do it, not to end up in jail again. KOZETA (ÇUADARI) ÇIKA KOZETA ÇIKA is an English teacher and translator from Tirana, Albania. She has graduated English Language and Literature at the Faculty of History and Philology, Tirana University. 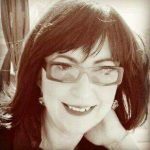 She has been a professional English teacher at the Foreign Languages School and Tirana University for many years, as well as teaching private courses in her own Teaching&Translating office since 1998. Currently, she runs her private Info&Consulting Office, in the field of news and educational issues. She has also worked for various translation projects with ACER (Albanian Centre for Economic Research), since 1998. Since 2001 she has been Albanian Rep for Liberty International. She has reported for various online newsletters and has translated and published libertarian and artistic literature into Albanian (20 books). She is the organizer of WalkForCapitalism (2001) and LI World Conference (2014) in Tirana. She was honoured with the Liberty Award at the Libertarian International World Conference in Lausanne, Switzerland 2013, for her work in favour of freedom in the Western Balkans. Has NATO Helped Or Hindered Balkan Peace?